The carrots brought over by the Pilgrims escaped captivity and adapted to growing conditions in most of the country. 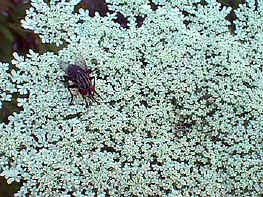 It's a wild carrot, not orange, but white, and doesn't have the flavor that we love in cultured carrots. Host plant for Black Swallowtail caterpillar, although it's not a preferred host plant. 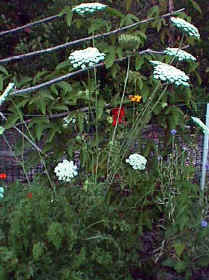 The leaves are too tough, and the caterpillars prefer parsley or fennel, but in a pinch, they WILL eat this plant. Not a true native plant in the US, but a great wildflower. Found in meadows and fields..
Propagation: Seeds - sow where it grows, keep moist until leaves appear, then it grows like a weed. Has a long taproot (a carrot) and doesn't transplant well. Soil and Fertility: Well-drained, unfertile soil. 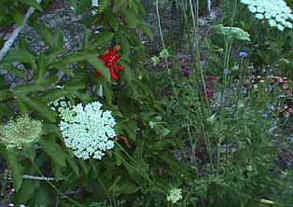 Dependable bloomer that provides nectar for the beneficial insects that prey on aphids. I've seen many insects nectaring on this flower.